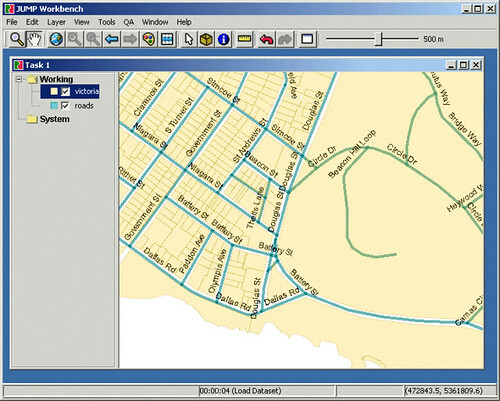 Just wanted to let people know about a free Java Geographic Information System (GIS) that I created with Martin Davis at Vivid Solutions. It's called JUMP, and you can use it to edit Shapefiles and GML. If you're learning Java it's also a good example of design patterns and Swing. And if you've been wanting to contribute to an Open Source project, this might be a fun one for you. JUMP is free; and it has been used on an important government project (RoadMatcher). posted by Jonathan at 5/15/2005 05:39:00 p.m.
Looks Interesting! Thanks for your comment on my blog. 1st I've ever gotten! Good luck with your Continuous Integration efforts. Once you start, you'll never go back. By Steve, at 5/15/2005 11:06 p.m.
Good to hear from you Steve! I'm looking forward to entering the world of Continuous Integration (I assume you are referring to Cruise Control). By Jonathan, at 5/15/2005 11:09 p.m.
By Jonathan, at 5/15/2005 11:14 p.m.
By Audi, at 5/30/2005 4:42 p.m.
jonathan, nice blog, i will start developing a plugin for JUMP. By Andres Herrera, at 11/29/2006 9:29 a.m.
By Jonathan, at 11/29/2006 9:22 p.m.